The tyre lever, though seemingly one of the simplest and most basic of cycling tools, is one commonly used by almost every cyclist, and unfortunately, one often responsible for unnecessary frustration. Really, what is more fun than flatting far away from home, being thrilled you lugged that spare tube and pump, and then having your tire levers snap in two? 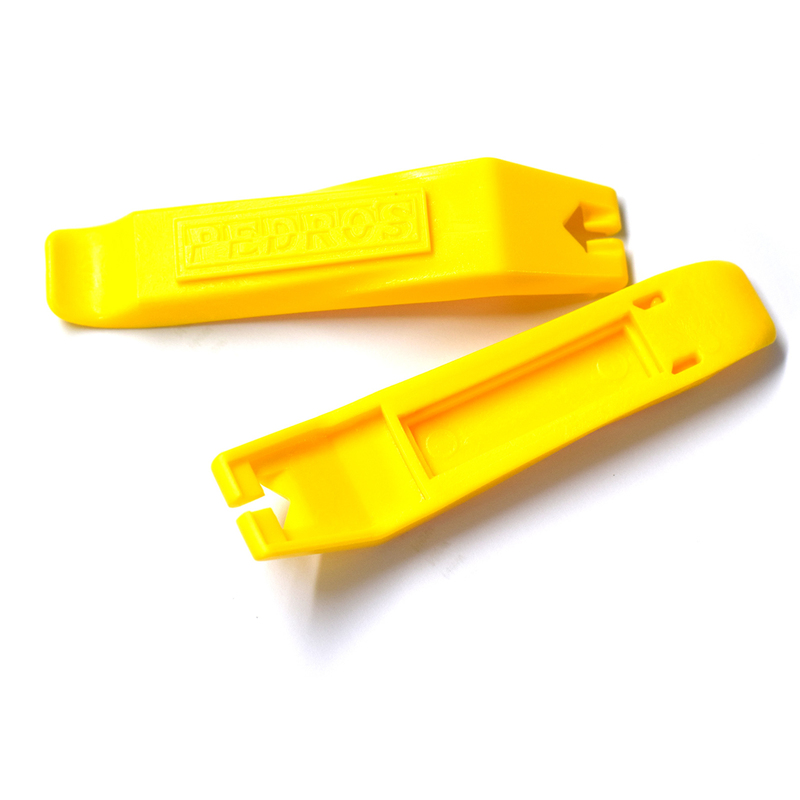 Pedro's tire levers are available in bright yellow, pink, green, and orange making them easy to spot in the shop or in the woods making sure you don't lose them. As long as your riding buddies don't steal them from you, we are confident the Pedro's Tire Levers will be the last levers you buy. Do yourself a favour and give them a try. You will love them! If you ever, somehow, manage to use your gorilla strength to break them, our levers are backed by Pedro's lifetime warranty, and we will happily replace them for you. Best tyre levers bar none. I'm never managed to break one. Nice solid tyre levers, quite an upgrade over my old parktool ones. Noticeably heavy, but I can't imagine them ever breaking! Was struggling to get a wire beaded tyre off my wheel big time. Snapped several tyre levers, including some that we thought were pretty decent... Some dude pitched up with 2 of these and got it off in no time. They're a bit bulkier, but you know they mean business and are less likely to break. Seemed to get between the tyre and rim really well too. After seeing these in action just once, I'd highly recommend these. They look good and sturdy. Fortunately I have not had to use them (no punctures yet!) but I'm sure they will work well. Pretty robust - Used them for years. I have broken one in the past but most other tyre levers would have given up way before the Pedro's did. Bright colour - so easier to find at the bottom of the bag. Best tyre levers I've ever used - and that's with 30 years cycling experience behind me. Mine were a lovely pink colour. 110 long and 41 grams a pair. Chunky and bomb proof to get any tyre on and off any rim. Top notch. Sturdy, great shape and does the job perfectly. Do the job of removing my tyres perfectly. Really strong levers. Don't need anything else really. First time changing a flat tire and they worked perfectly. Nice and sturdy yet lightweight lever set. Bright colour ensures hard to lose on the side of the trail. Excellent sturdy pair of tyre levers there will be no flex with these bad boys. I already have one set in my saddle bag and just purchased another set for home. I like these tire levers better than others. Good solid feel to these levers. Really bright colour, should be easy to spot in case you drop them on a grass verge somewhere. Nice to be backed up by lifetime warranty, even if they are one of the cheaper items in your toolbox. Best tire levers out there. I use them for DH tires and they work well. Super strong and don't damage the rims. Look Strong and is strongly recommended . Have not used it yet ! Had a pair of tires which were impossible to mount, with these levers it made the job easy.